Thanks to support from Catholic charity Aid to the Church in Need (ACN), a new diocesan center has opened in Novosibirsk, Siberia. The center is also a memorial to martyr Bishop Alexander Chira (pictured left). The Apostolic Nuncio to Russia, Archbishop Ivan Jurkovitch, Bishop Joseph Werth of Novosibirsk as well as the Catholic Bishops of Moscow, Saratov and Irkutsk inaugurated the new building on Tuesday, November 8. The Orthodox Archbishop of Novosibirsk conveyed his best wishes, and representatives of the city brought flowers. The Consul General of the Federal Republic of Germany in Novosibirsk, Neithart Höfer-Wissing, also attended the inauguration. “The diocesan center is also a gift to the City of Novosibirsk,” Archbishop Jurkovitch emphasized. ACN, a major supporter of the building project, was also represented at the inauguration by Peter Humeniuk, its country officer for Russia. The diocesan center has a floor area of 23,680 square feet and was built directly next to the Catholic cathedral. The new building was urgently needed because the cathedral, built just over ten years ago, and its adjacent buildings no longer enough space for Church activities. The new complex now houses the diocesan administration, community and seminar rooms, as well as a hall for large-scale events. The new building bears the name of Bishop Alexander Chira, who was initially compelled to spend years in prison camps during the period of Soviet persecution, including in Novosibirsk. For many Christians, Bishop Chira is considered to be a martyr, because he selflessly endured persecution and oppression and gave strength to the faithful by his courageous witness. 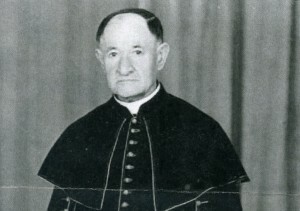 Although well aware of the consequences, Alexander Chira allowed himself to be consecrated as Bishop in 1945. Shortly afterwards his arrest and internment followed, and then deportation to Kazakhstan in 1957. For more than two decades he worked here as a simple pastor for Russian-German Catholics among others. Bishop Chira died in 1983 at Karaganda, the birthplace of Bishop Werth. The Bishopric of Novosibirsk began the construction of the new “Bishop Alexander Chira” diocesan center in the spring of 2010. As the total cost of over $5.15 million far exceeded the resources of the diocese, two-thirds of the funds came from donations. ACN provided a contribution of $678,000. The diocese covers an area of more than 770,000 square miles with some 25 million inhabitants. The number of Catholics is estimated at several hundred thousand. With nearly 1.5 million inhabitants, Novosibirsk is the third-largest city in Russia. It is situated in West Siberia, east of the Urals on the River Ob.